Azerbaijani Foreign Minister highlighted the important role of the OSCE in solving the Nagorno-Karabakh conflict and other regional issues. Elmar Mammadyarov made the remarks at the 20th meeting of the OSCE Ministerial Council in Kyiv on December 5. 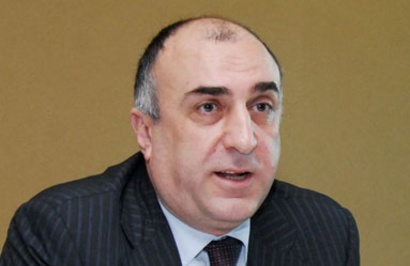 Mammadyarov said Azerbaijan believes a full utilization of the OSCE`s comparative advantage in being the only regional body with such a unique comprehensive security concept and broad and diverse membership is of utmost importance. "It is our conviction that dialogue and respect for the undiminished value of the Helsinki guiding principles of 1975 are the imperatives for realizing the core tasks of OSCE. In this regard, we commend the Ukrainian Chairmanship for launching discussions within the Helsinki+40 process and effectively guiding it," Mammadyarov said. He said Azerbaijan hopes that the Roadmap suggested by the incoming Swiss and Serbian Chairmanships will provide a good opportunity for achieving progress in most problematic areas, such as resolution of protracted conflicts and arms control. He went on to say Azerbaijan's experience in the UN Security Council and its collective efforts with partner countries have proved that dialogue and cooperation, based on full respect for the norms and principles of international law, is the best remedy to restore trust and stabilize volatile political and security environments. "We are convinced that the establishment of a genuine OSCE security community without achieving substantive results on these tracks is hardly possible. The issue of illegal deployment of troops and heavy arms in the occupied territories of the OSCE participants is the major cause of the ineffectiveness and gradual failure of existing arms control regimes. It is obvious that one cannot succeed in establishing fair, verifiable, and predictable arms control mechanisms without demilitarizing the conflict-affected territories," Mammadyarov said. The confidence and security building measures cannot be taken out of the overall political and security context, in particular when conflict-affected territories are considered for their application, he added. The assumption that CSBMs and regional cooperation have the potential to resolve a conflict when its political and security consequences have not been properly addressed is utopian, Mammadyarov said. "The OSCE field offices and institutions are important assets for assisting the participating states in strengthening security cooperation and implementing the commitments they have undertaken. In the meantime, it is embarrassing when an OSCE institution, which is based just on its technical mandate and expertise without proper knowledge of political and security environments and coordination with OSCE's chairmanship and secretary general, delivers official statements on behalf of the organizations on a political matter such as election monitoring results. Therefore, we believe that reviewing the role of ODIHR in election processes should be a part of the Helsinki+40 process," Mammadyarov said. "We highly appreciate the OSCE Ukrainian Chairmanship's invitation extended to the Cooperation Council of Turkic Speaking States to attend the OSCE Ministerial Meeting", he noted. "We believe that participation of the Cooperation Council of Turkic Speaking States as a regional cooperation mechanism in the work of the OSCE will contribute to achieving the goals shared by the two organizations," Mammadyarov said. Referring to the recent meeting between the Armenian and Azerbaijani Presidents in Vienna, Mammadyarov said after the meeting and under the President's instructions, he and Armenian Foreign Minister Nalbandian, together with the co-chairs as well as separately, started an intensive round of consultations on moving beyond the unacceptable status-quo in the settlement of the Nagorno-Karabakh conflict in the near future. The Nagorno-Karabakh conflict emerged in 1988 when Armenia made territorial claims against Azerbaijan. Since a lengthy war in the early 1990s that displaced over one million Azerbaijanis, Armenian armed forces have occupied over 20 percent of Azerbaijan's internationally recognized territory, including Nagorno-Karabakh and seven adjacent regions. "The honorable delegations present in this hall are well aware of Azerbaijan's position, which is based on the four resolutions of the United Nations Security Council, the guiding principles of the Helsinki Final Act, and relevant OSCE documents," the minister said. Mammadyarov said Azerbaijan believes that the basic principles reflected in the joint statement of the presidents of Minsk Group co-chairmen countries in L'Aquilla in 2009 could serve as a basis for opening substantive talks on a comprehensive peace agreement. He said such an agreement will envisage the implementation of practical measures, where every step will dictate the next one and be based on certain timeframes and preceding elements. "It will include all the reasonable CSBMs, starting with the withdrawal of Armenian troops from the seven occupied districts surrounding Nagorno-Karabakh, providing security guarantees for the population, reopening the borders, conducting communications, and gradually bringing Armenian and Azerbaijani communities closer to each other," Mammadyarov noted. He said these steps will accommodate the concerns and interests of both sides, setting them in a consistent process that is monitored, assessed, and guided on a regular basis by the international community. "We believed that in order to reach a breakthrough in negotiations we need to get rid of the factor of the presence of the Armenian military forces in the occupied territories. We firmly believe that the demilitarization of the conflict zone will provide more room for engagement on all possible tracks, create more confidence in both parties and the communities of the Nagorno-Karabakh region of the Republic of Azerbaijan, and decrease military rhetoric and tension in the region," the minister said. Mammadyarov called on the Armenian leadership to demonstrate a constructive approach for achieving a breakthrough in the negotiations and give its agreement to start together with co-chairs of the Minsk Group substantive talks on comprehensive peace agreement. Mammadyarov also held a number of bilateral meetings on December 5 in Kyiv as part of his visit to Ukraine to attend the 20th meeting of the OSCE Ministerial Council. He met OSCE Secretary General Lamberto Zannier, OSCE Parliamentary Assembly President Ranko Krivokapic, Ukrainian Prime Minister Mykola Azarov, as well as Georgian, Belarus, Turkish, Serbian, Estonian, Finnish and Kazakh counterparts to discuss regional issues, the ways of solving the Nagorno-Karabakh conflict on the basis of principles and norms of international law, as well as the bilateral cooperation. Why Armenia avoids Karabakh talks?